This tutorial also includes how to select a template and publish the page to your website; plus an overview of every other conceivable option. Pages are similar to Posts in that they have a title, body text, and associated metadata, but they are different in that they are not part of the chronological blog stream. Pages are not categorized or tagged, but can have a hierarchy. You can nest Pages under other Pages by making one the “Parent” of the other, creating a group of Pages. The Page editor works mostly the same as the Post editor, but there are some Page-specific features in the Page Attributes box. Under Pages in the admin menu, the top two items, “All Pages” and “Add New”, are the default items that will appear. If I installed the Page Dropdown menu plugin for you, then you will see a list of all your published pages, as shown in the image below. 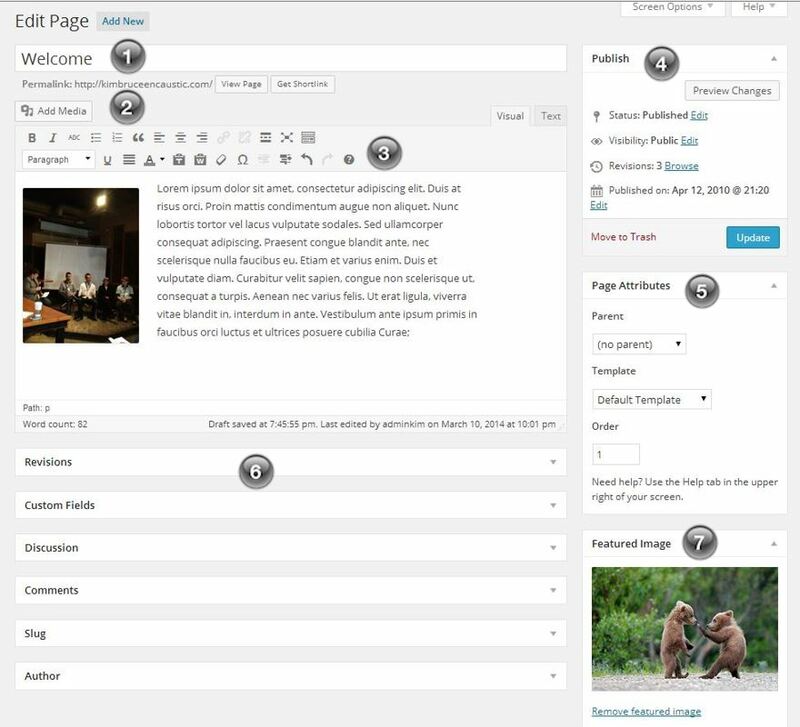 brings you to a screen that lists all published pages and drafts. When you hover your mouse over a page title, a sub menu appears. Trash: moving the page to the trash, removes it from the list of pages. If you have added the page to the WordPress menu (see Managing Menus), you will also have to remove the item from the menu to delete it from your site navigation; otherwise a 404 error will appear when a visitor clicks on the menu item. Quick Edit: allows you to make changes to the page attributes; not the actual content. Changing the page title or template are the two most common reasons to use quick edit. To work on an existing page, or add a new page, Navigate to Pages, select your option and the editor will open as shown in the image below. The Title Field and the big Post Editing Area are fixed in place, but you can reposition all the other boxes using drag and drop, and can minimize or expand them by clicking the title bar of each box. Use the Screen Options tab to hide or unhide boxes or to choose a 1- or 2-column layout for this screen. If you think you lost a box chances are it was inadvertently moved under the editor or accidentally removed via the screen options area. Check both of these to find and reinstate the missing box. Title: When you create a new page, where to title the page will be obvious, as WordPress has default shadow text that says “Enter title here”. This appears where “Welcome” appears on the image above. You can use a single word or a phrase but you should never use the same title twice, as this can cause problems in the database. You can use commas, apostrophes, quotes, hyphens/dashes, and other typical symbols. WordPress will clean it up for the link to the post, called the post-slug. Permalink: This is the URL friendly version of the page title. It has to be all lowercase with a dash between words. 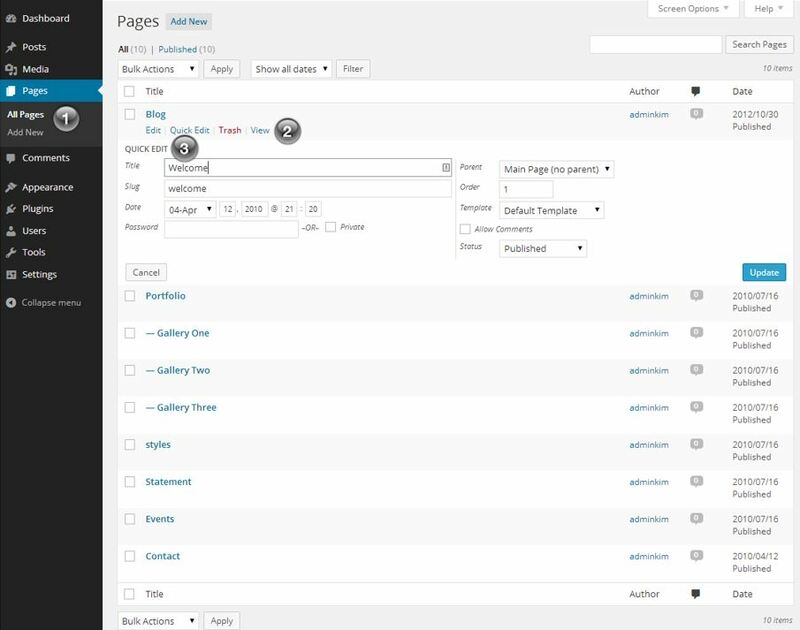 WordPress creates it for you when you enter a page title and save it for the first time. You don’t have to do anything here unless you want to shorten your page URL or change the page title at a later date. View Page: this will open the page so you can see what it looks like on the live site. Note: the formatting you see in the editor is not always what you see on the site, so it is a good idea to have a look before publishing. Add Media: Use this to upload and insert all kinds of media on to your page. After the upload is complete, you can add descriptions and titles. There is a whole lesson on adding media. Please see Insert Media. Note: Uploading Media here does not insert it into NextGen Gallery; only into the media library. Visual/Text Tabs: To the right of the top area of the editor, you will see two tabs. The Visual view is similar to what you see in word processing programs like Word. If you switch to the Text view, you may see code that is applied by the styles you apply in the Visual Editor. Using the Text view is for advanced users only, and those who know how to use HTML. You DO NOT need to know any HTML to use WordPress and will make out just fine staying in the Visual Editor. Editor Command Buttons: A basic install of WordPress adds editor commands that you see in the image above. Hover your mouse over the icon and a small tooltip will appear that tells you what the button does. Visual Editor: This is the task pane where you add all the content that will appear on the page of the live site. This screen also has the distraction-free writing space, available in both the Visual and HTML modes via the Full Screen buttons. Typically, the button for this is the second or third last button on the top row of editor icons. If you only see one row of icons, find the icon with the tooltip “show hide kitchen sink”. This will expand the icons into 2 rows. To close full screen editing mode, make buttons visible by hovering over the top area and select Exit Full Screen to go back to the regular post editor. TIP: To maintain single spacing while writing use “Shift + Enter” on your keyboard. Publish: Before your page will appear on the site you need to publish it. See the section below on Publish for available options. Page Attributes: Before you publish you can apply attributes. See the page attributes section below that describes these options in detail. Custom Fields: You will probably never need to use this field as it requires some coding to use manually. Although some plugins and themes have attributes that you can apply to further the functionality. To keep things simple, Artbiz themes do not use Custom Fields. Disscussion: By default, WordPress adds code for comments to appear on pages. With Artbiz Artists Themes the comment code is removed so that the pages look like a typical website. There is more detail about this on Create a New Post in WordPress, as it is on your blog that you will actually use the Discussion Field for comments. Comments: Same as discussion above; used for the blog. Slug: This is an advanced option – it’s automatically populated if you don’t put anything in. Until you get to more advanced techniques, you can leave this field alone. It describes the permalink path when the permalinks option in WordPress is set. Author: If your site has multiple authors, you can change who the author of here. But when you start out working on your website/blog, it is easy to forget to set your Nickname and your username will appear as the page/post author. If you need to, you can select the nickname you want to appear here. Nicknames are set under Your Profile. Revisions: WordPress has an autosave feature that will compile a number of page revisions. If you think you have lost the content of your page, check and compare revisions. Restore the one you want. Note: Since revisions are compiled and kept in the database, the database can quickly become bloated with redundant page revisions. Use WP-Optimize (tutorial coming soon) to clean and delete these items from your database. SEO: Add specific search engine optimization for each page individually. There is more instruction for this in the SEO for Artists tutorial. Feature Image: This allows you to associate an image with your post without inserting it into the content area. Depending on your theme the feature image may show in the content area or as a thumbnail in blog excerpts. Some plugins, like an eCommerce plugin, also allow you to set a feature image for a product. Select the image using the “Set Feature Image” link and add the image the same way you upload a single image, by making sure you select the “use as feature image” option. Word formatting can drive you crazy when you are trying to get things to look right. That’s because Word applies formatting that is meant for printing, not websites. Browsers can not read this formatting. When coping from a Word document, paste it into the page using the “Paste as plain text” button on the editor. A dialogue box pops up with instructions to use “ctrl+v” on your keyboard to insert it into the dialogue box – then click insert. If you do it this way, it strips out the Word formatting that over rides the set CSS styles that come with the theme. 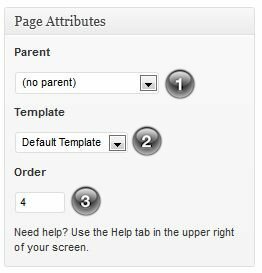 Parent: under Page Attributes in the right column, select a parent page from the drop down menu – only if you want the page to be a sub-page of another; otherwise leave it at the default “Main Page (no parent)”. Template: select the template you want the page to appear on from the drop down menu. Artbiz themes have two templates; the “default template” is a single column full width page. The “Page with Sidebar” is two columns with the a widgetized sidebar. Order: pages will usually appear in alphabetical order, but you can choose your own order by entering a number (1 for first, etc.) in this field. If you use WordPress’s menus then you don’t have to worry about numbering your pages. You can preview the page by clicking the “Preview” button on the right above “Publish”, at any time. Status: tells you the current publishing state of your page: published, draft or pending review. For a one person administered site you are unlikely to use “pending review” as that status is used by a “contributor” user. Draft: use this to save your incomplete work not yet ready to publish. Publish: When you’re happy with the page click “Publish”. If you use the Menus, go to Appearance>Menus and add your new page to the menu. 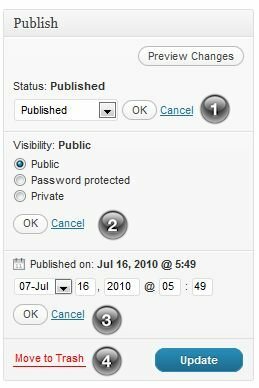 Visibility: by default, when published, your page is viewable by the “public”. Password Protected: Use this for content that you want accessed via password. Once selected you will be prompted to enter a password. Private: the page will only be viewable by you and only when you are logged in to your site. Published on: You can select a date and time to publish. This can be particularly helpful if you want to create content in advance. Move to Trash: moving a page to the Trash does not delete the page from the database, only from your list of pages. If you move a page to the trash, make sure you also remove it from the Menu. To delete the page permanently, you will need to empty your Trash by going to “All Pages”, opening the Trash link and click the “empty trash” button. TIP: You can un-publish a post or page at anytime with out trashing it. This is particularly handy when you want to remove a past event, but save the page/post for adding future events. I want to point out a commonly missed step when moving an existing page to the trash. Moving a page to the trash does not remove it from the menu. If you are using WordPress Menus for your site navigation you will also need to remove the page item you just trashed from the menu.